Sustainable food systems have come a long way; however, food transportation remains conventionally unsustainable. FOODLOGICA closes the loop, developed after a long period of research into food systems and the innovative potential of using local food as a tool for urban development. 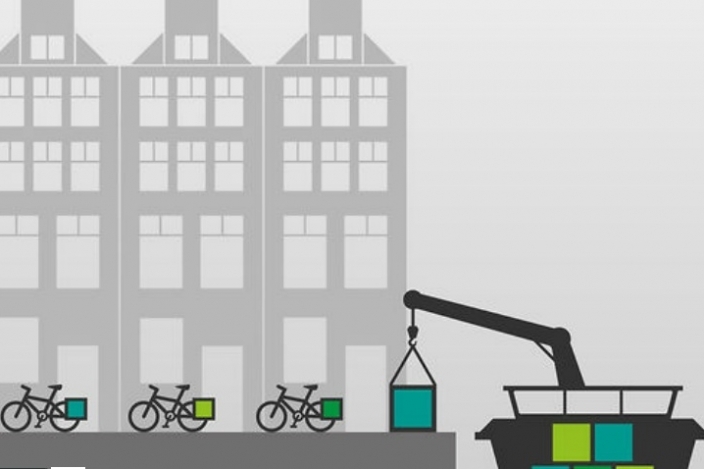 FOODLOGICA is designed to clean the last ‘food mile’ of Amsterdam’s local system. Providing a clean logistic service using special-made electric cargo bikes, FOODLOGICA links local food, consumers and businesses in Amsterdam’s city center through transport that reduces pollution, congestion and energy use. Clients of FOODLOGICA’s services are diverse, suiting local businesses such as food shops, small-scale food producers, chefs, restaurants, and other food related local actors in Amsterdam’s innovative, bike-friendly city. FOODLOGICA lives to elevate the virtuous cycle of food in the urban ecosystem by integrating convenient, zero-emission transport: we strive to provide a logistical service that supports local, quality food producers and businesses, guarantees fresh delivery for optimal sale and consumption, and pushes a blend of traditional, innovative and cultural behaviors into urban development. RENT FOODLOGICA: Renting the electric cargo bike, including the driver, to businesses such as small cafes, chefs and restaurants at an hourly price. For instance, independent chefs are in need to bring their tools and ingredients to their work location (house, company or event), while small cafés and restaurants might want to provide ‘at home’ delivery services to their clients or arrange delivery using affordable, suitable and sustainable means of transportation. LOAD FOODLOGICA: Web-shops prepare food deliveries in ready-made crates and send directly to clients’ in vans. Rather than vans, FOODLOGICA loads the ready-made crates at the web-shop’s warehouse and delivers to our clients desired destination using electric cargo bikes. PROMOTE FOODLOGICA: Since our bikes travel throughout the city, FOODLOGICA provides opportunities for businesses to feature advertising on bike’s cargo boxes. Optional advertisement packages are based on the size and duration it will be featured on the cargo box. Greater promotional opportunities are available by participating in FOODLOGICA’s growing on and off-line community. BE FOODLOGICA: Participate and become part of a new community of local food actors, equipped with FOODLOGICA certification that generates mutual communication, promotion and practices. Being FOODLOGICA is being part of creating new sustainable business standards for local food consumption. After research proved the sustainability and profitability of FOODLOGICA, it is now in a start-up phase. Starting June 2014, we began prototyping the business using one electric cargo bike and a small team of people managing project development and business growth. During this process, we are searching for financers to develop organically as the business grows.